In the last week, I have noticed more than one client relying way too heavily on information appearing on a credit report. These clients were under the impression that if something falls off the credit report, that they no longer owe any money to that particular creditor. What these clients are failing to understand is that the credit report is not a full listing of the amount of debt owed. The credit report rather, is a document utilized by lenders to determine credit worthiness. To whom a debtor owes money and in what amount is important to lenders in determining whether or not a person should receive a loan and if so, at what interest rate. The mistake of viewing a credit report to determine your actual outstanding debt is a red herring. One reason why you should not look solely to your credit report for your total debt is that not all creditors are going to report to the three credit bureaus. In fact, many medical providers will not report a medical debt unless it is being collected through a third-party collector. Thus, a person could owe thousands of dollars in medical bills and none of them may show up on credit report. Additionally, a creditor can write off the debt and yet the debt can still be sold or collected upon by another party. 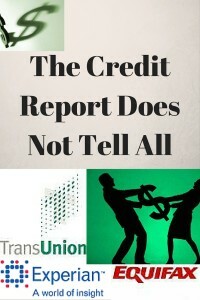 Further, there is commonly misinformation listed within a credit report. Oftentimes, the credit report will be filled with debt that is not technically in the debtor’s name. In other cases, and more commonly, there will be debts that are legitimate which are not listed properly or at all on the credit report. I try to advise my clients that they should look at the credit report as one source of information regarding their debt. They should not rely on it exclusively. They should not think that if something is not on the credit report that it is not owed. They should not take the credit report as the gospel with regard to their financial situation. By doing so, a debtor mistakenly can be led to believe that a certain debt is owed or is not owed simply by appearing on one of the three major credit bureaus, Equifax, TransUnion, and Experian. The better advice is to take the information on the credit report in conjunction with other statements, bills, and collection letters to account for the entire debt situation. With regard to the two clients I mentioned earlier, they no longer wished to file for debt relief based upon the fact that they feel that there is no longer a debt owed. I advised them that there is a chance that a third-party collector or other debt buyer will pursue them in the future. I told them both to leave the door open with regard to hiring my services as I will be available to help them if the situation arises down the road. Oftentimes, a person thinks that they are in the clear for debt simply because it is not being pursued at the moment. However, several months in the future, they may be subject to a civil lawsuit, garnishment proceeding in state court or other asset seizure attempt by a creditor. If this were to happen, chapter 7 bankruptcy or Chapter 13 bankruptcy will still be available to provide the relief that is needed. In summary, the credit report doesn’t tell everything. It tells a portion or a partial story of someone’s credit and debt situation. It should not be relied upon in totality.